The smartphone capital of the world has found an innovative and environmentally-friendly way to charge all those homegrown Samsungs and other mobile devices—Seoul, South Korea, is planning to install five charging stations powered by three mini-hydroelectric turbines embedded in the manmade Cheonggyecheon River that runs through the capital’s downtown. Seoul-based startup Enomad says the stations will be able to charge a smartphone in 2 to 3 hours and a tablet in 3 to 4 hours from turbine generators that produce 15 to 20 watts. If the three-month pilot is successful, the charging stations could be expanded further along the 10.8-kilometer (6.7-mile) waterway that is part of a $900 million urban renewable project that opened to the public in 2005. South Korea is one of the most wired nations on the planet. More than 70 percent of the country’s 50 million residents have smartphones, which is the highest penetration rate in the world. Smartphones are so popular that the government has begun a campaign to battle smartphone addiction. South Korea also boasts the fastest bandwith speeds in the world with plans to upgrade the nationwide network to 5G Internet. The country will test the 5G service at the 2018 Winter Olympics in PyeongChang. “The small-scale hydropower generation facility minimizes negative effects on the environment as it produces electricity without dams or barrages. It requires only simple turbines,” a city official told the Korea Herald. In addition to the water-powered charging stations, the city also plans on providing its citizens with solar-powered charging booths around Gwanghwamun in central Seoul. 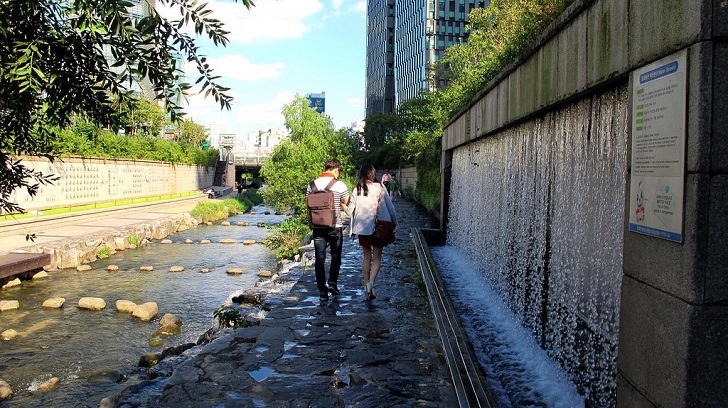 Seoul, South Korea is planning to install five charging stations powered by three mini-hydroelectric turbines embedded in the manmade Cheonggyecheon River that runs through the capital's downtown. If the three-month pilot is successful, the charging stations could be expanded further along the 10.8-kilometer (6.7-mile) waterway that is part of a $900 million urban renewable project that opened to the public in 2005.